Sno Cone Rentals are a must in the summer in Arizona, cool off with a Blue Raspberry Sno cone and get the kids favorite Bubble Gum Flavored. 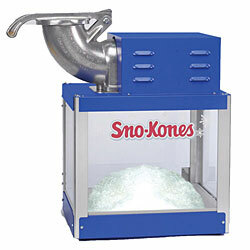 Sno Cone Machine rentals are delivered to Phoenix, Scottsdale, Peoria, Glendale Arizona and Surrounding Cities. Snow Cone Machine rental includes 2 flavors of your choice Cherry Blue Raspberry, Bubble Gum, Grape flavor and 50 snow cone cups. Ice not included. You will need a 20lb bag of ice for 50 Snow Cones.